On March 22, the National Law Enforcement Museum’s Teacher Advisory Group (TAG)—composed of primary and secondary level educators who teach in public and private schools in Washington, DC; Maryland; and Virginia—had the opportunity to learn from a seasoned and innovative law enforcement professional. TAG meets quarterly to advise Museum staff on practical classroom applications and program ideas leading up to the Museum’s opening. During the last meeting, the group heard from Major Randall Murphy (Ret. ), Director of Advanced Immersion Technologies for Meggitt Training Systems. Major Murphy travelled from Georgia to present his experience in directing groundbreaking research on a gripping subject: combat stress and its effects on police officers in a virtual environment (and by extension, in the field). The presentation was truly eye-opening for our teachers—it provided insight into how hard it is for officers to make split-second decisions in extreme stress conditions. Major Murphy’s findings conveyed how vital simulated training is for officers, and how it saves lives. Part of the video presented by Major Murphy. We are thrilled that Meggitt Training Systems has generously agreed to donate one of their training simulators to the Museum. The simulator will be a key experience—the most immersive opportunity visitors will have to walk in an officer’s shoes. As part of their donation, Meggitt Training Systems is also giving the Museum and its Teacher Advisory Group access to some of their amazing trainers and researchers. Major Murphy’s advice and input will ensure that this experience in the Museum will be the most authentic that visitors can have. The virtual experience may not be real, but it is intense. Visitors will be forewarned! Last night, the National Law Enforcement Museum held the ninth event in our Witness to History series, sponsored by Target. For the second time, the Museum partnered with the International Spy Museum, our host for a great evening and fascinating program: DarkMarket & the FBI Agent who Became Master Splyntr. Craig Floyd, Chairman & CEO of the National Law Enforcement Officers Memorial Fund, kicked off the program by welcoming the nearly 150 guests in attendance, and thanking the event’s sponsor, Target, and host, Peter Earnest, Executive Director of the Spy Museum. He then introduced the panel moderator, Shawn Henry, former Assistant Director of the FBI and current President of CrowdStrike Services; and panelists, J. Keith Mularski, FBI Supervisory Special Agent; and Kevin Poulsen, Investigations Editor of WIRED Magazine. An expert on the topic of cyber crime, Shawn Henry reminded the audience that everything we do is being transmitted and stored digitally—hence why it is an incredibly important issue. He explained that, cyber crime is a lot like organized crime groups from the past. “Just like in dark alleys in your cities, but instead they’re virtual,” he said. One of those virtual dark alleys was called DarkMarket, an international one-stop shop for selling stolen personal credit and identity information online. It became a hub for underground criminal enterprise, with over 2,500 registered members at its peak. Both panelists brought unique perspectives to the DarkMarket case and the topic of cyber crime—Keith Mularski from the view of an undercover agent who ran the site, remaining mostly undetected for two years (2006-2008), and Kevin Poulsen from the view of a reporter (and former hacker) uncovering emerging technologies and their effects on society. Agent Mularski and other agents involved with DarkMarket had to work with law enforcement in several countries, including Germany, the United Kingdom, and Turkey. The successful case ended with more than 60 worldwide arrests and the prevention of some $70 million in financial loss. Best advice for protecting yourself from cyber attacks? I.T. professionals need to stay ahead and make sure all networks are protected with the most up-to-date firewalls. Thank you to all who were able to join us! Stay tuned for our next Witness to History event. The Museum’s recently-acquired collection of more than 200 historic law enforcement photographs contains a small number of ca. 1880 stereoview cards (also known as stereoscopic photographs or stereographs). 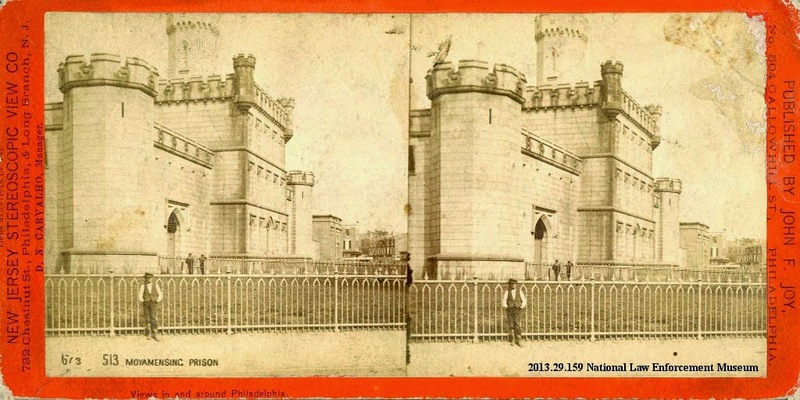 One stereoview image features a unique view of the the Moyamensing Prison in Philadelphia. This prison, described as being “built for the ages” in an 1839 history of Philadelphia, opened in 1835 and was demolished in 1968. A little research revealed several “arresting” facts about the prison. The architect of the U.S. Capitol Building, Thomas Ustick Walter, also designed the Moyamensing Prison. Walter, who designed the wings and dome of the Capitol and created its modern, iconic appearance, served as the fourth Architect of the Capitol. He began his architectural career with the design of Moyamensing, a combination of Gothic and Egyptian Revival styles. Considered a humane design for its time, the prison was constructed over three years, from 1832-35. Edgar Allen Poe was once imprisoned there… Apparently, Poe became drunk and suicidal one night in 1849. He was arrested for public drunkenness, slept it off in prison, and was released the next day. …and so was Al Capone (but for only one night). On May 16, 1929, Capone and his body guard Frank Cline were arrested in Philadelphia by Detectives James “Shooey” Malone and Jack Creedon. They both spent at least one night in several penal institutions in the area, including Moyamensing. Later Capone was transferred to Eastern State Penitentiary and was released several months later. Moyamensing was the site of Pennsylvania’s last execution by hanging in 1916. In 1834, Pennsylvania was the first state to abolish public hangings, which had become notorious public spectacles. Each county thereafter carried out “private hangings” within the walls of the institution until hangings were replaced with electric chair executions. America’s first known serial killer, H.H. Holmes, was hanged at Moyamensing. Herman Webster Mudgett, also known as Dr. H. H. Holmes, was one of the earliest-known serial killers in the United States. A swindler and scam artist, he became notorious for his killings, when, during the 1893 Chicago World’s Fair, he lured victims to his infamous “murder castle” by offering his large home as a hotel. His killing spree horrified and fascinated the public, and he was hanged for his crimes in May 1896 at Moyamensing.